Rescue a horse without leaving your office or couch. 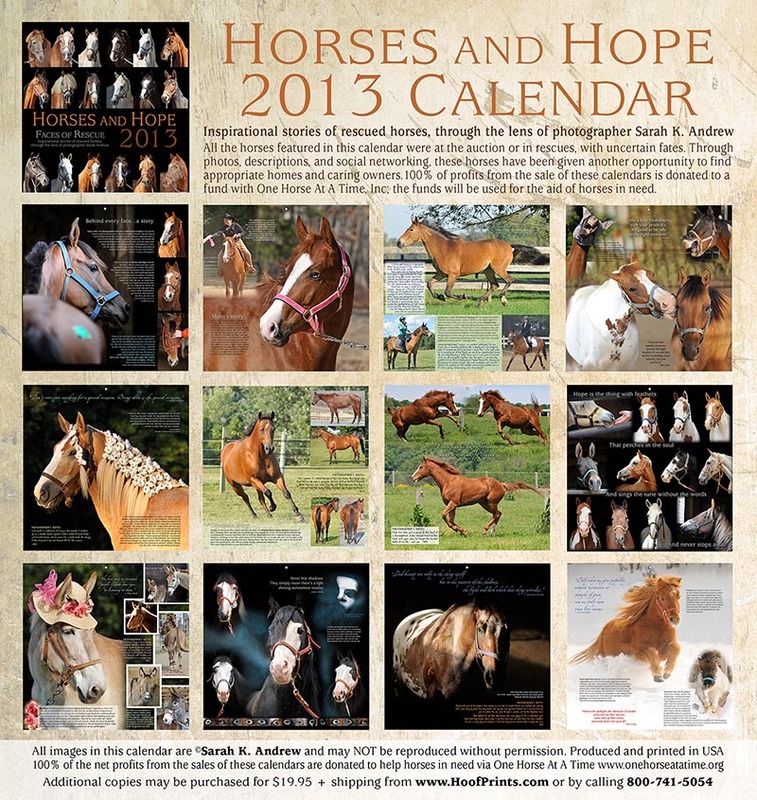 Buy another calendar this year and help save hundreds of horses from slaughter. Last year, horse lovers around the world raised $40,000 just by buying calendars. Let’s do it again, this year. Let’s save more horses and make a difference in the lives of these wonderful, spiritual animals. What could be easier? I asked that question last year…and I’m asking it again this year. For $19.95, you will get a beautiful calendar and gift and a horse may just get a second chance at life. Buy one special calendar and you might be able to help save one of the thousands of healthy, lovely and loving American horses that are slaughtered every year. Offered by Hoofprints.com, the calendar is the result of a group of horse lovers watching horses going to an auction house and deciding to make a difference. They created a calendar featuring some of the horses they met. Printed on heavy stock, the photography is exceptional and even more so because of the conditions under which the horses are being held and the pictures are taken. As with last year’s calendar, each month features another beautiful horse, photographed by well-known professional photographer Sarah K. Andrew. Every month you meet another horse whose life path should have taken it to fields of clover and sunshine on its back. The horses, thoroughbreds, Appaloosa’s, paints, chestnuts and Belgian, colts, mares, geldings and stallions, are magnificent, proud, standing tall. Here’s the good bit. The profits — all of them — are donated to a dedicated fund with One Horse At a Time, Inc. Money from the sale of these calendars goes to rescue horses — period. The calendars are available at Hoofprints and only cost $19.95. And they make great gifts for anyone who loves horses or just loves animals. For each of these horses and countless others, the end of their lives is not going to be spent in a warm, sunny field in a forever home. It will end with a trip to feedlots like Camelot in the middle of New Jersey and a swift trip to Canada or Mexico where horses go to die. Many of the horses know they are no longer home but they don’t understand what is happening. The horse lovers who created this calendar understand and are not standing around, watching. They act. Sarah K. Andrew makes time to photograph every horse sold to the feedlot. Volunteers evaluate the horses the best they can and a large network of horse people distribute photos and descriptions of the horses, from Facebook to feed stores.They work with the owner of the auction to resell the horses who didn’t get a high enough bid to leave the sale. Since the effort began in November 2009, no horses have shipped to slaughter from the auction house, and well over 2,000 horses have been purchased and re-homed out of just one feedlot. I can’t buy another horse. But I can buy a calendar or two. And so can you. Please act. Please help save these horses whose only mistake was being sold by someone who used to love them. Thanks for the support. I love these calendars and am so glad I can help…even in this small way. I can’t afford another horse but I can afford to buy small but wonderful gifts for my horsy friends….and maybe help this horse rescue save one more horse! Happy Holidays! And happy riding…. Thinking the same thing Susan! I want one for me and have at least 4 horsey friends who will need calendars next year so I’m ordering holiday gifts, early. I bought two even though I am unemployed. I can’t afford another horse – can’t even afford the one I have but I will do without to keep Buzz in grain and hay! This group of people is amazing. Have been following them on Facebook and contributing to the rescue when I can but that’s all I really can do other than write about them. You’re purchase will help and you’re going to love the calendar, too! I so wish I was rich and could do so much more. At least I can write about these brave horses and the even braver people like you who work so hard to save them. Thanks for your kind words and know I will keep writing.